*PDF available here for printing. Lectures are free and open to the public. To account for numbers, please RSVP here. I will talk about two major Buddhist movements in contemporary South Korea, the Jungto Society and Indra’s Net Community, that address issues in daily lives of lay people. Visionary monks began these movements: Jungto was established by Pomnyun in 1988 and Indra’s Net by Tobop in 1999. Both began as grassroots communities based on Buddhist principles, seeking an alternative way of thinking and living in response to contemporary society’s emphasis on mass consumption, commercialism, competition, and the exploitation of the natural resources. 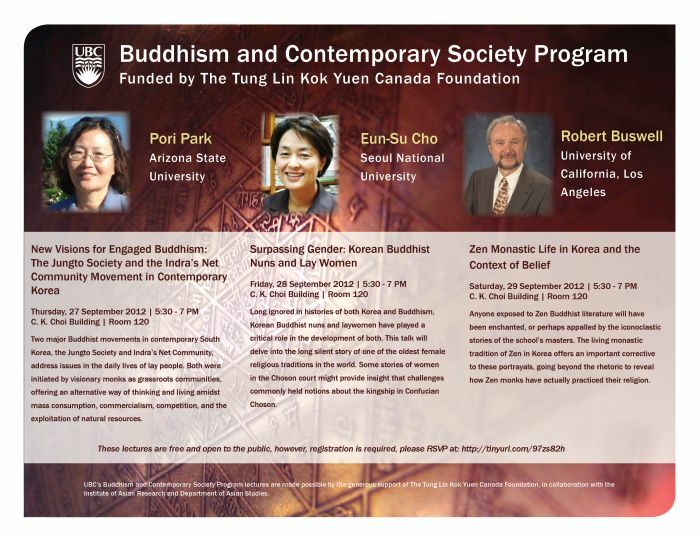 Dr. Pori Park is the associate professor of religious studies at Arizona State University. Her research has focused on the intersection between Buddhism, colonialism, modernity, nationalism, and globalization. Her recent publications include Trial and Error in Modernist Reforms: Korean Buddhism under Colonial Rule (2009), “Buddhism in Contemporary Korea,” and “The Buddhist Purification Movement in Post-Colonial South Korea”. Long ignored in histories of both Korea and Buddhism, Korean Buddhist nuns and laywomen have played a critical role in the development of both. This talk will delve into the long silent story of one of the oldest female religious traditions in the world. Some stories of women in the Choson court might provide insight that challenges commonly held notions about the kingship in Confucian Choson. Dr. Eun-Su Cho is a professor of Buddhist Philosophy at Seoul National University in Korea, and currently the director of the Institute of Philosophical Research. She received her Ph.D. in Buddhist Studies from the University of California and was an assistant professor in the Department of Asian Languages and Cultures at the University of Michigan. Her research interests include Indian Abhidharma Buddhism, Korean Buddhist thought, and women in Buddhism. Anyone exposed to even a little of Zen Buddhist literature will have been enchanted, or perhaps appalled, by the iconoclastic stories of the school’s masters. Whatever one’s reaction, it is hard to remain neutral toward a religious tradition that portrays its most revered of teachers as torching their sacred religious icons, bullying their students into enlightenment, rejecting the value of all the scriptures of Buddhism, even denying the worth of Zen itself. The living monastic tradition of Zen in Korea offers an important corrective to this portrayal, which will allow us to go beyond the rhetoric of Zen texts to perceive how Zen monks have actually put into practice the doctrines and teachings of their religion. Dr. Robert Buswell holds the Irving and Jean Stone Endowed Chair in Humanities at the University of California, Los Angeles, where he is also Distinguished Professor of Buddhist Studies and founding director of the university’s Center for Buddhist Studies and Center for Korean Studies. Buswell is widely recognized as one of the premier Western specialists on Korean Buddhism and the broader East Asian Zen tradition. He has published fifteen books and some forty articles on various aspects of the Korean, Chinese, and Indian traditions of Buddhism. In 2009, he was awarded the prestigious Manhae Grand Prize in Korea in recognition of his pioneering contributions to establishing Korean Buddhist Studies in the West. These lectures are made possible by the generous support of The Tung Lin Kok Yuen Canada Foundation.